Recently I've been experimenting with Linux's ptrace(2) syscall. Unfortunately, there isn't any kind of "official" documentation for it and the manual page is quite poor. There are some other attempts to document it, for example in the strace sources or in several introductory tutorials online, but nothing explains how ptrace works from the ground up. > in there for the the past few years. More importantly, we're not ever going to get rid of it. Ptrace is a complex, low-level debugging facility, and the magic behind tools like strace and gdb. Importantly, ptrace doesn't require administrator rights. Okay, but what exactly does it mean for a process to be "stopped" and what is wait(2) doing? Ptrace reuses a common Unix mechanism of "stopping" and "continuing" processes. Let's forget about ptrace for a moment and dig deeper into this - the linux process state logic. A process starts its life in an R "running" state and finishes after its parent reaps it from the Z "zombie" state. Yup, our sleep command is running again. Actually it's sleeping in the S "interruptable" state. If you wish to see R "running" state use something CPU-intensive instead of sleep, say: yes > /dev/null. Each signal has a current disposition, which determines how the process behaves when it is delivered the signal. Stop   Default action is to stop the process. if it is currently stopped. $ python -c "import os, signal; os.kill(os.getpid(), signal.SIGSTOP)"
By default waitpid blocks until a selected child exits, but by setting specific flags we can also receive notifications about other state changes: a child process being stopped (flag WUNTRACED) or continued (flag WCONTINUED). A zombie process is a process that exited successfully, but its state change wasn't yet acknowledged by the parent. That is, the parent didn't call wait() / waitpid() functions. 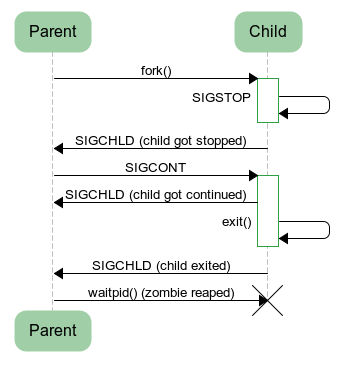 The Z "zombie" process state is required in order to give a parent time to ask the kernel about the resources used by the deceased child, using getrusage(2). A parent informs a kernel that it's done with the child by calling waitpid. Process states form an interesting mechanism that is basically creating a synchronous communication channel between a parent and a child process. For example - if a child changes its state to "stopped" state, a parent can wait for that using waitpid. Later it can order a child to continue by sending SIGCONT. This mechanism is not flawless - if a child goes into "stopped" state and quickly receives SIGCONT, the parent will receive SIGCHLD, but waitpid may miss the state change. "Stopping" and "continuing" is the mechanism used by ptrace to controll a debugged process. First, on initialisation ptrace causes the current (debugging) process to temporarily become a parent of a debugged process (let's call it "adoption"). As a parent it will be notified about child process state changes. Next, various ptrace flags inform the kernel to put the child into "stopped" state when particular debugging events occur. When such an event is triggered the parent receives SIGCHLD, can retrieve child status via waitpid and has a chance to inspect the stopped child. When it's done, it puts child back into "running" state. We'll see how to use ptrace to do this in the next part of this tutorial. The way ptrace works is a huge abuse of the original Unix process model, but in practice it seems to work quite well. However this mechanism is not very efficient due to the high overhead of constant context switches between the parent and the child. With this restriction in place untrusted ptrace can be only be run against the parent's genuine children, "adoption" is not possible any more without administrator rights.